The Miata has been called everything from a “Hair Dressers car” to the “roadster that saved the sports car world”. So which is it? Once we had gotten the first reviews under our belts we needed to decide what type of car to review next and it quickly became clear we wanted to hit the truly affordable fun to drive little sports cars from a few decades back. 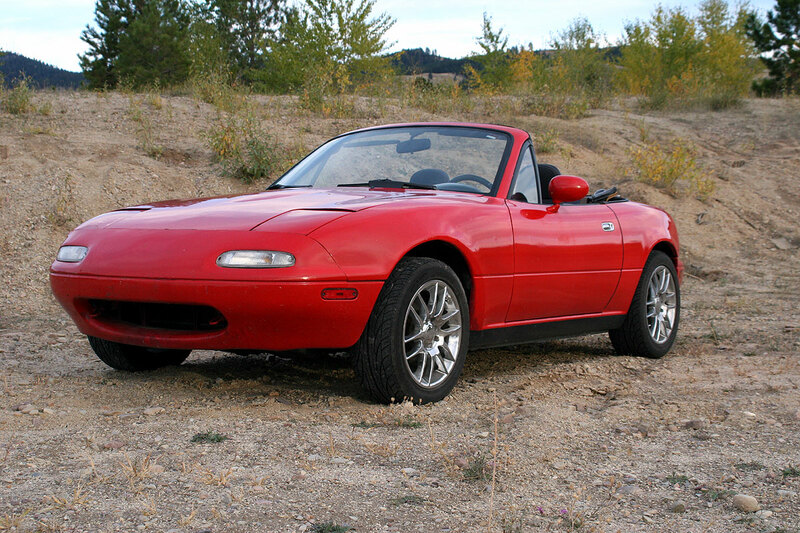 After searching around the internet for a while, looking for something entertaining and affordable, we stumbled upon a Mazda MX-5, more commonly known as a Miata. 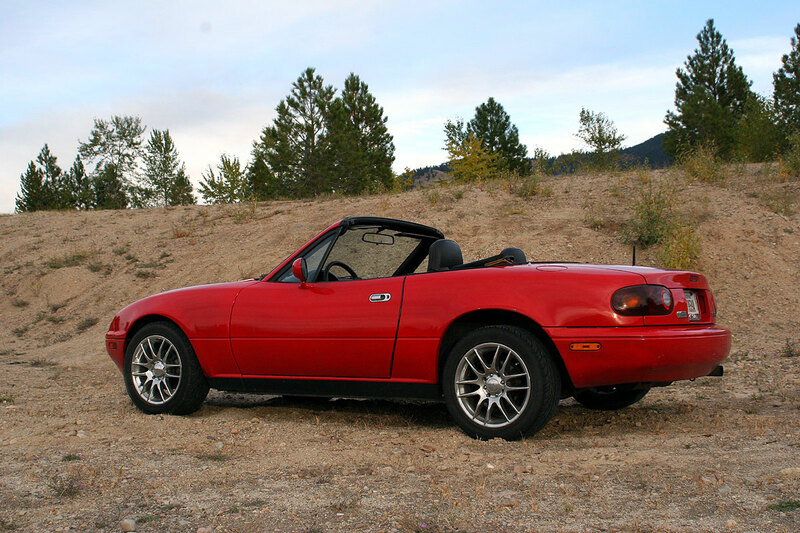 The Miata got us thinking, and reminded us, that this little car has always been praised for its true Driving Feel and so we thought, “Perfect!” and started looking for the right one to buy and bring in for review. 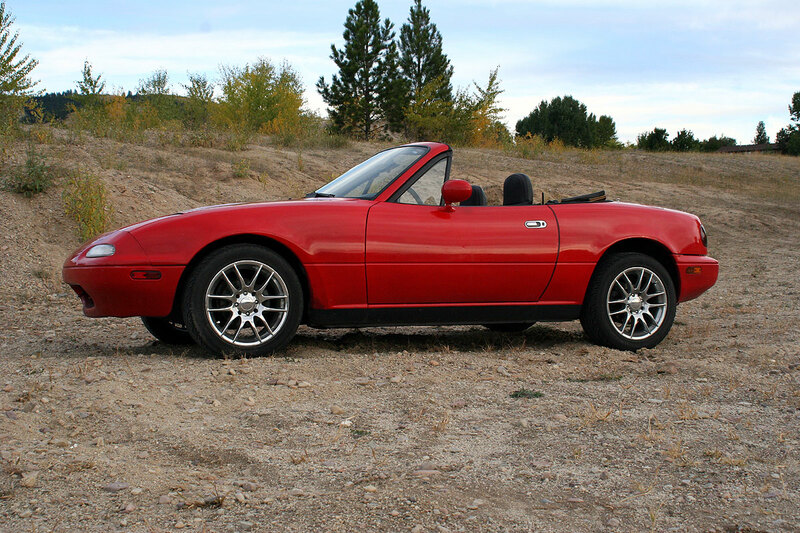 The Mazda Miata erupted on the scene in 1989 at the Chicago Auto Show and was available that year as a 1990 model and sold at that time for $13,995 USD. The Miata was designed and patterned after the classic British and Italian roadsters of the 1960’s and was a very simple car of minimal size and weight and powered by a modest 4 cylinder, only 98 cubic inches, with 115 Horsepower. Everything on the car was very simple; a manual folding top, manual steering, and air conditioning was only available as an option. The styling was a classic revisit to the roadsters of old and the car was an instant hit and has continued to be very popular through the years. 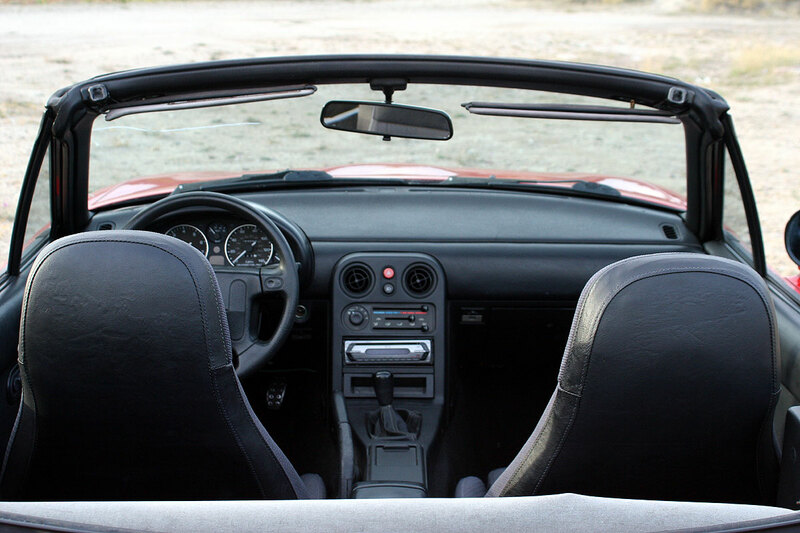 The current Miata is in its 3rd generation and as always happens, the Miata has added complexity, features, weight and cost, but it is still considered to be the leader in affordable roadster fun and is still thought to be a real drivers car. We wanted a first generation car to test so that we experienced the car in its original conceived form and also wanted to see what fun could be had on a real budget. We were able to locate a 1990 Miata not too far away from us that had just over 100,000 miles on it, which many consider to be low mileage for these cars. 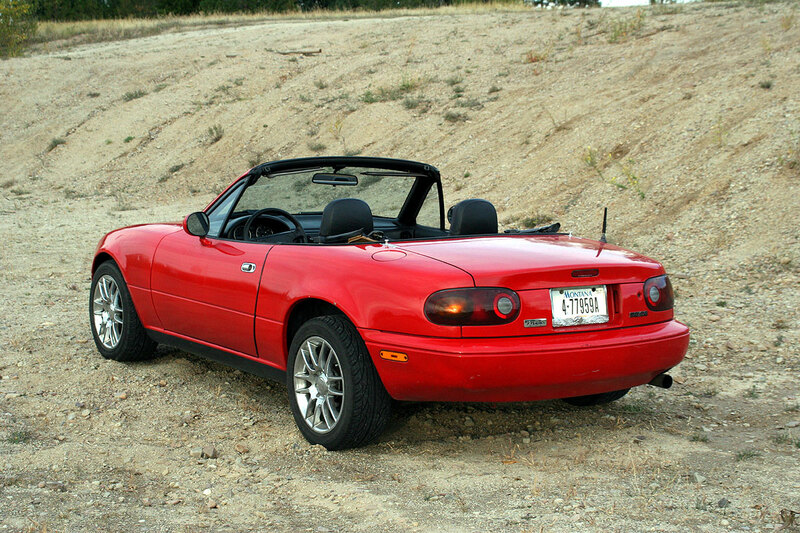 It was red, the classic Miata color, with a tan top and black interior. We were able to buy it for under $3000 and drove the one hour back to our garage. The car had been neglected for a bit so some routine maintenance needed to be done which included a full tune-up, 4-wheel alignment, fuel filter, and some other items. 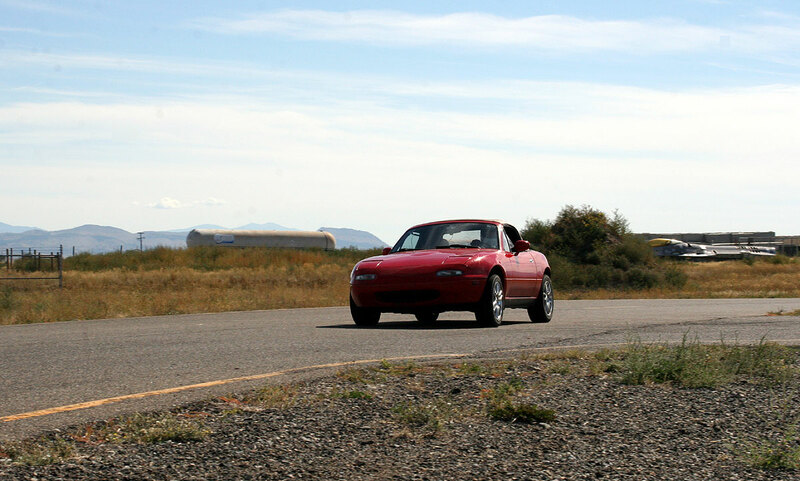 After getting those items taken care of, the Miata was ready to be put to the test at the track. These first generation Miata’s are small, very small. The curb weight was reported to be right at 2000 lbs, which puts it in the same category as a Lotus Elise, and like Colin Chapman always said, the car is better for it! Of course, with the light weight comes some trade off’s, to include a very noisy cabin, no A/C (it was optional), hand crank windows, mechanically adjusted seats, and some other basic frills. In all honesty, we didn’t miss any of these things. We are of the opinion that if the lighter weight will help the car drive better, then we don’t have a problem hand cranking the windows! We only wish more car companies did this today, or at least offered a no frills version of their basic coupes in an effort to save both money and weight for the true car enthusiast. The test track is about 115 miles away and while on the interstate, the little Miata was a bit out of its element cruising at high speed. Though it did get 34.4 MPG on the way over, which made it our economy king up to this point in our young car review history. The Miata drove fine on the interstate but without cruise control or some of the other creature comforts it wore on the driver a bit. It was still an okay car to drive over a longer stint, it is just a more entertaining car on short, top down, back country roads than high speed interstate cruising, which brings us to the one basic truth about the car… it is FUN to drive! There really is no other way to explain other than it is fun. The car is not fast, in fact, most modern economy cars today are faster around the race track than this base first generation Miata, but with its non-power assisted steering, rear wheel drive, and light weight, the car is a hoot to drive around town and around the race track. This is what Miata drivers have been raving about all these years when drivers like us have ignored them. We never thought we would like the Miata, but this unmodified little go cart is just plain fun to drive. The feedback from the steering is excellent and the steering is a little heavy at slow speeds, but once going above 10 mph it lets the driver read the road surface like my kids read Harry Potter books. The car does not have enough power to break the rear end loose, especially without a limited slip differential, but that is part of the fun. You can drive the little car as hard as you possibly can and get a lot of joy from the car, but the whole time you are never really taking the car to any dangerous speeds that would scare you or get you into too much trouble with the law. There is no stability control or traction control, but the car doesn’t really need it. It is easy for even a novice driver to take around the race track safely and have a blast doing it which will then get them hooked and wanting to come back for more. It seems to be an ideal little entry level track day car. The acceleration of the Miata is, how do we say this, SLOW. With 115 HP we thought the car would do a bit better, but this one may have been a bit tired and not putting out the full 115. We don’t get crazy with our acceleration tests (no speed shifts, shifting well below redline, etc) as we are trying to preserve the cars we test, but even still, any car that takes double digits to get to 60 MPH is considered slow. With 60 mph coming in 12.08 seconds and the quarter mile passing at a leisurely 18.73 @ 72 mph, the Miata is anything but a rocket ship. Since we are focused primarily on fun to drive cars, we always go for a manual transmission when available and with the Miata the shifting is closely spaced, so close that a few of us missed gears when rushing the shifts on the track, but the mechanism was precise and positive for each gear and overall we liked it. After driving it around the track a few times, the missed shifts became less frequent and it was a joy to row through the gears. The brakes offer a good feel, but the lack of ABS certainly hurt the stopping distances taking 169 feet to go from 60 to 0 mph, a good chunk of those feet were spent with four wheels locked up and skidding while we tried to modulate the brakes. The initial turn in was hampered by tires that were oversized. The larger than factory tires is a common modification for Miata’s as many drivers like the look of the wider tires and bigger rims, but in reality, we think this actually slightly hurt the handling and driving feel of the car. We believe the car would have even better turn in and feel with the standard width tires. The tires were an off brand tire as well and we are certain there is more performance available in the handling department with a good set of new tires on the car. 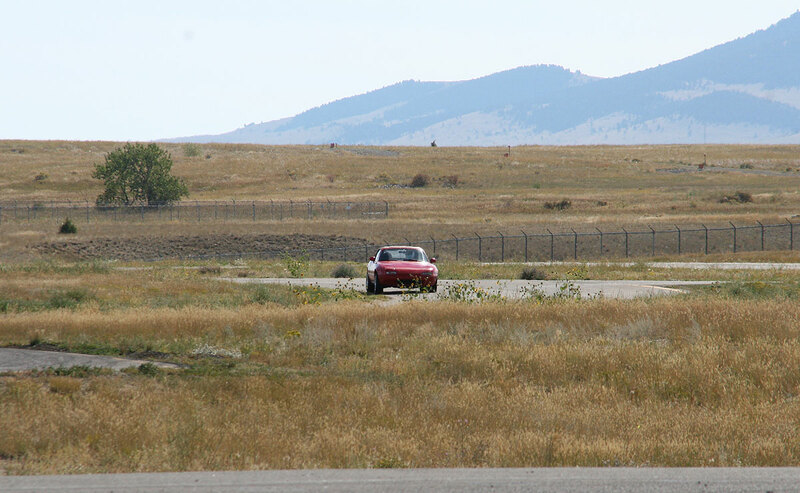 But even still, for a split second, the little Miata pulled over 1G on turn one at the track, which is impressive. Even when pushed beyond its limits, the car was easy to catch even with our excessive hooliganisms we were doing. There were times we thought for sure a spin was in store, but amazingly we were able to catch it before it happened, which had nothing to do with talent and everything to do with balance. The steady state turning grip was not the best at .83G on average and there was mild understeer, but there is room for improvement with better tires. Overall, we rate the handling of the Miata as excellent. The pedals are decently arranged and some heel-toeing is possible, but the pedals are a bit too far spaced to really get into it. 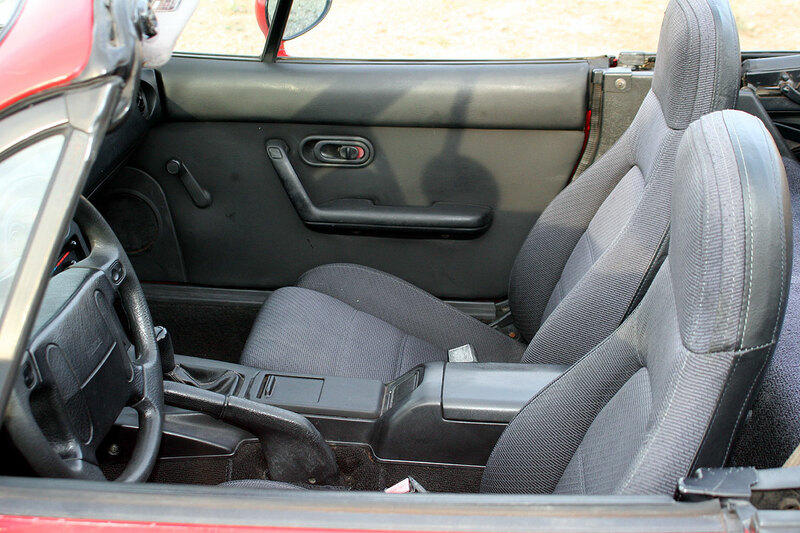 The cloth seats are sporty, but not a true sport seat and they worked just fine. The steering wheel itself is a good shape and size, if not plain by today’s standards. Everything is arranged as it should be and the simplicity of the cars keeps everything clean. The top is easy to drop by just releasing two latches and folding it back. Putting it up is the reverse process. The best lap time was 1:14.35 (74.35 seconds) at an average speed of 55.20 mph around the Helena test track, it is slow, but it was a 75 second long smile. All and all, this car was a blast and we were thrilled with its performance and it scored very high on our subjective Driving Feel scoring system. If money is tight, we are not sure there is a more fun car you can purchase with just a few thousand dollars. They are not practical and they are not luxury cars, but they are a great driver’s cars that are very fun to drive, even if they are not fast. Of course, we will continue our search to find one that can do better, but for now, this is a bargain budget smile generator.